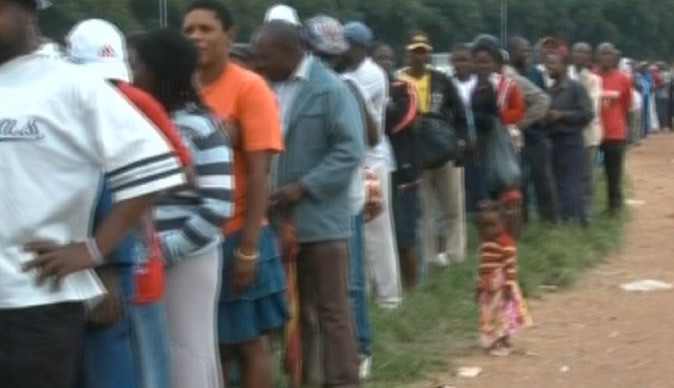 We have a problem with who the voter is in Zimbabwe. Only at election time do our politicians start thinking about who will vote for them. Who is expected to vote at election time anywhere? How much does he know about voting? I'm afraid this is where the politics in Zimbabwe goes to the mortuary. It simply dies there. Even the contestant can not identify his voter. How can he. He is as empty as the voter is, except for hefty parliamentary perks which are the catalyst for corrupt politicking. The voter does not understand the importance of his decision as to who to vote for and why. Politicians should stay with their voters and not go to them only when the election is by the corner and they want their vote - no. This is abusive pollitics because they then resort to bribing them with cheap presents. They know what they want, dont they, but they will only remember that at election time, why. Why do we make useless of our fellow citizens like that? Why do we despise them so much that we think they are not worth anything but abusing in a very insulting way too? We don't give them respect and a chance by equiping them enough to be able to decide their destiny in a more informed manner. We take advantage of their political ignorance and pounce to our advantage. Why? Perks!! People don't vote for a candidate of their choice - no, they vote for a political party needs and needs that have nothing to do with improvements of their livelihoods. Oh please! According to the Zimbabwe electoral laws, the Electoral Commission is responsible for voter education throughout the country. Do they have the resources to do it effectively? What is the content of this 'voter education'? Why do they not vet and register some non governmental organisations to assist them conduct voter education. Build a political rights conscious curriculum starting from 'how to select your candidate' as a voter - a bit of socio defensive politics to avoid loading our parliament with sociopaths, because right now, it is really stuffy in there. Have a thorough program of training of trainers workshops using a fine tuned curriculum. We should have done this in 1980 by the way, instead we chose human slaughtering for a voter campaign and so far we have slaughtered +30 thousand people just for political mileage and maintenance of power. Zanu pf is doing that and apparently they are still in power. What an animal way. It is so flabbergasting to read some artitles telling us to give zanu pf a chance. A chance? A chance to do what? A chance to continue killing us? This is exactly the reason why we have a confused electorate. An electorate that is less informed, with not even the basics of politics and at most afraid of an independent decision. In the rural areas, the political mentors happen to be war veterans with a mentality demented by political indoctrination and operating as zanu pf propaganda machinery. Its all distortion here and reality is far far away. When is sanity going to reign so our people are liberated from this incarceration by these barbaric maurauders calling themselves democratic politicians. Right now, out of a population of +13 million we have only +2 million voters , why. I'm not surprised because how does the current government leadership even qualify for public office. Not surprised either when you can have Mnangagwa for president and Obert Mpofu for home affairs. These people are not motivated by eagerness to perform for their country, no, they are afraid their past will come to haunt them. Some offences here may be carrying more than life sentences, I mean in a sane world. So its a case of maintaining the status quo, and what status quo may that be by the way. Dont be fooled. If you can't feel the nusty taste, you probably don't have a tongue for it.